The police intervention at the Gorilla Protest in Bratislava on March 9, one day before the general election, is set to be investigated by the Office of the General Prosecutor after 172 citizens submitted complaints over the matter, the Gorilla Protest Civil Movement announced on Tuesday, April 10. The civil movement claims that the police “were misused against defenceless people” in what it says was an “unlawful and brutal intervention”. A criminal complaint was filled by citizen Štefan Potocký from Kalná nad Hronom (Nitra Region) back in March. 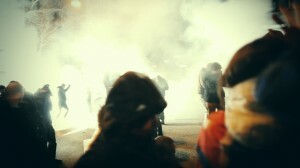 “We carefully considered filing the criminal complaint after the Interior Ministry released a statement that the police intervention against the demonstrators was justified and appropriate, as the protesters were throwing cobblestones [against police officers],” said Potocký, as quoted by the TASR newswire. Potocký claims that the incident was provoked by the police, who accompanied the protesters during their march towards parliament, where riot police were waiting. “Defenceless and peaceful citizens were then dispersed by [riot police] in a brutal manner,” Potocký claims. Along with the criminal complaint, he supplied video recordings and pictures from the scene that he said prove that the rally was actually peaceful.